The Vikings just opened a new indoor home last week, and it's already getting an upgrade: a field of real grass. "We're putting in a temporary soccer pitch for the international match, which is next week," said Steve Bush, owner of Bush Sports Turf, the Quad Cities company that bought the grass from a farm in Wisconsin. "We're coming in, we're covering up the artificial field and we're installing inch and a half thick blue grass sod on top for them to play on." The turf was grown on sand, making it ideal for indoor applications with minimal drainage. 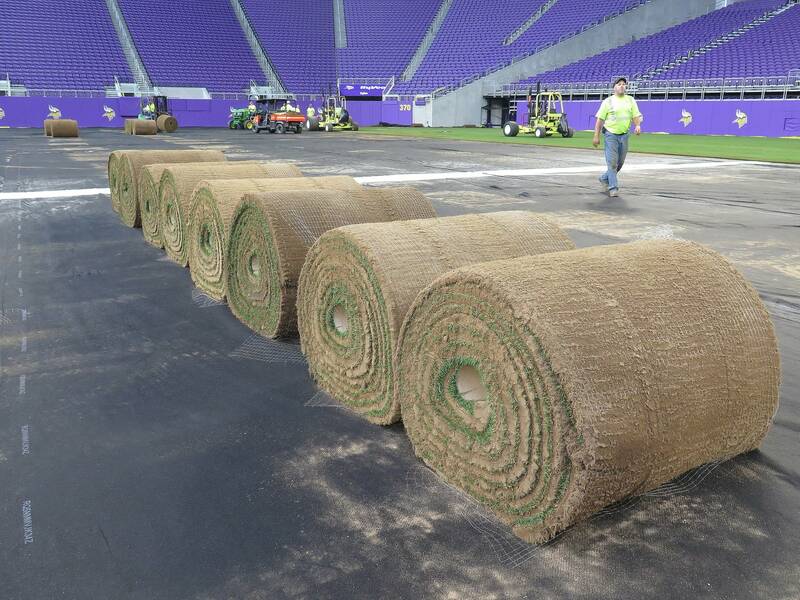 The turf is cut from a sod farm field and rolled up at night, trucked it to Minneapolis in refrigerated trucks and installed quickly to keep the grass cool and alive. It comes in rolls 42 inches wide and 40 feet long. They weigh about a ton each, and it takes 30 semis to haul the 580 rolls of sod. The grass is being installed over a removable plastic deck, which is covered with a waterproof barrier so the grass can be watered and mowed. A layer of fabric is laid on top of the barrier to stabilize the sod. "Most people ask, 'Well how are you going to play a game on this field that's just installed?' Well, the sheer weight of the sod being installed holds it in place," Bush said. "And then we have some special machinery that we've developed that actually pushes the sod together and squeezes it so that the seams won't separate later. And that's how you're able to install these fields and play on them so soon." After the game, it will be removed and composted. A.C. Milan and Chelsea, two well-known European teams, will play the exhibition match in the new stadium next Wednesday. Promoters say they expect more than 55,000 fans for the game. "When you look at competition at this level around the world, this is the surface they're accustomed to," Bush says. "So when you're hosting the top athletes in soccer, this is the surface they want, this is what they need to play on."